November comes and I can’t help thinking of Thomas Hood’s gloomy poem that ends “No fruits, no flowers, no leaves, no birds! - November!” Thanks for that Mr Hood, but I beg to differ. It has been a wonderful year for fruit and many apples still hang on the trees - the thrushes will be feasting well into November. Botanically speaking, any seed-bearing structure is a fruit; an acorn and its cup and a winged ash key as much as an apple. There are some fascinating creations out there with intriguing and sometimes exotic names to go with them. English has some simple, earthy words for common types of fruit – pods, keys, burrs and conkers come to mind. I love the almost onomatopoeic quality of “pod” – you can almost hear it popping and shedding its dry seeds... po!... ddd! Burrs are fruits covered in hooked bristles which cling onto animal fur and woolly jumpers (they were the inspiration for Velcro, no, really). Keys, for instance of ash and maples, are seeds with wings; sometimes you can watch them travelling hundreds of metres from the parent tree. And I trust we all know conkers. Botanical terms tend to be more of a mouthful but can be delightful words – in botanical circles a key is a samara. This wonderful word almost suggests the distant land which the tree is dreaming of when it releases its fruits to fly for a few short but romantic moments. Botanists like to invent technical terms to distinguish between similar structures, for example the pods of the cabbage family. There are shorter, wider pods – such as the neat ones which give shepherd’s purse its name - and longer, thinner ones, for example those of cabbage itself. A wide pod is a silicula and a narrow pod is a siliqua. At this time of year the siliculae of honesty are particularly eye-catching – shiny, transparent silver purses showing the flat, penny-like seeds within (their name derives from this honest confession of their seed wealth). 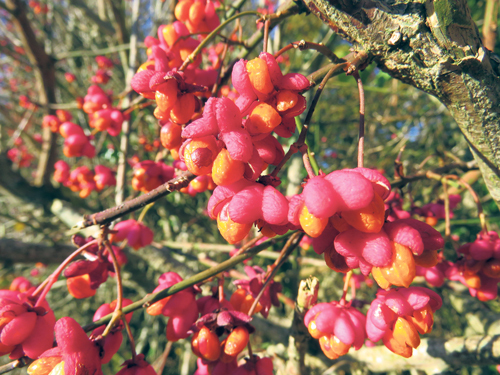 One of the most beautiful fruits belongs to the spindle, a somewhat nondescript hedgerow shrub. But in autumn, nestling amongst the candy-pink leaves, hot pink pods appear, cubic in shape, bulging at the corners, which split open to reveal the most astonishing orange seeds. Such delicious colours – even the most glamorous sweet shop must be jealous (but don’t try to eat them – these must be left for the birds). And finally it is a good time of year to look for jays – they are out and about, collecting and storing their favourite fruit – the acorn. An acorn is the “fruit” of an oak tree and jays are thrifty hoarders, remembering where every acorn is stashed. Apparently some children’s dictionaries have dropped the word “acorn” on the grounds that children don’t use it much – shame on you, dictionary compilers! We should not let any child grow up without knowing what acorns are, and who likes eating them.